Funeral Greeting Cards aren’t always fancy, but they are the best tools you can use to communicate the death of someone who has just passed away. While it is possible that you have the forte in design and can create the cards yourself, you may not have the time for sure. That means, downloading an already built funeral template is the best alternative to creating one yourself. Following are some of the best premium cards that you can use for funeral invitation. 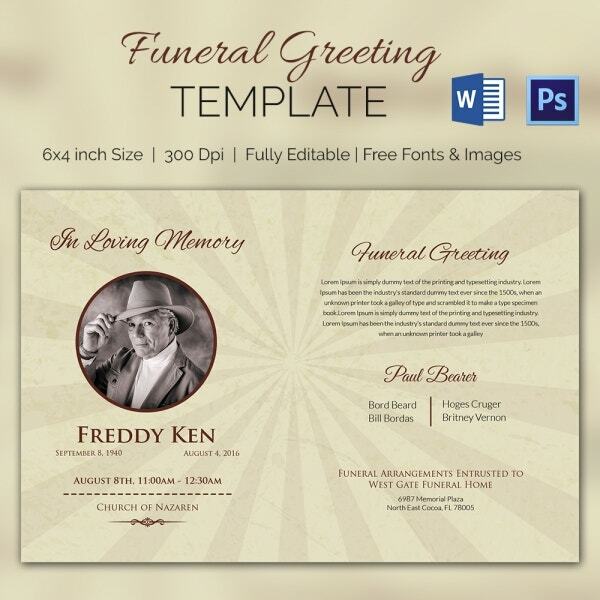 Send your funeral greetings to friends and family members with this template. Customize the template in Word 2013 or use Adobe Photoshop if you would like to edit the entire model. The premium template is cheap, too. Use this template if you want to send greetings to family friends and colleagues. Customize the text so that it suits your taste of a good template. The template is beautiful as is, so there is no need to modify the design. The template supports bleed and uses the CYMK color model. Moreover, it is easily editable and 100% customizable. It is the best template to use if you would like to send you greetings fast. Because you can pick this template straight out of the box and customize it for use, you really shouldn’t be bothering to create a flip of the layout from scratch. 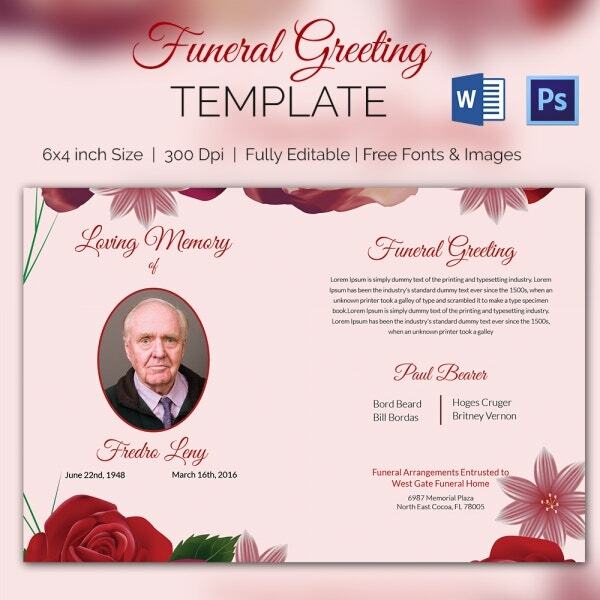 Simply download the premium template and use it for the funeral announcement. The reasons for using this card may differ from person to person. No matter what is your objective, the greatest benefit of preparing the greeting card is that you never have to spend time creating this template. Just download it and you are good to go. > Who Should use Funeral Greeting Cards? Family members can use the funeral greeting cards to tell friends, colleagues, and other family members about the unexpected death of a loved one. 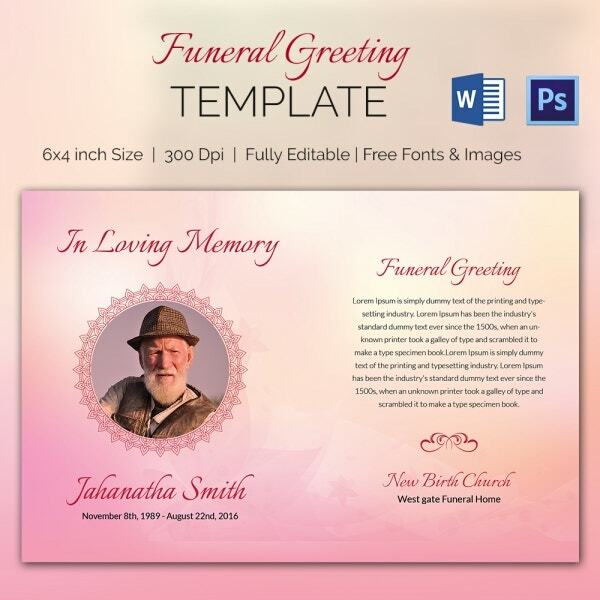 Of course, the funeral greeting cards are almost always easy to create, however, even if design is your forte, you may want to consider downloading a premium template instead. 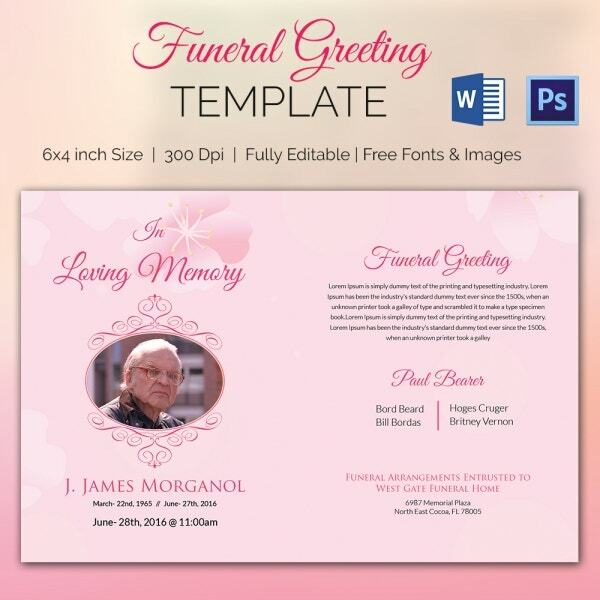 The funeral templates not only saves time and money, but also eliminates the need to spend time on your computer to design the best funeral greeting cards. > What are the Benefits of the Template? 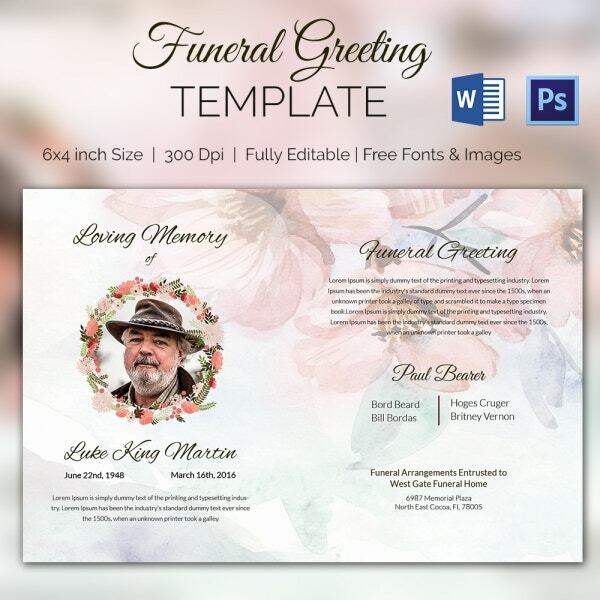 Memorial Program Template is a special theme that creates a strong connection between the sender and the recipients. It always contains the message of love, togetherness, and union in the moments of sadness. It helps to create reminders that we are here for a short time, that we should lead a life of love for one another and peace for all. If you want to share the message of hope after the death of a hero, this could be the best theme to use. The messages written on these cards often vary, but they all come down to one thing: giving hope to those left behind. 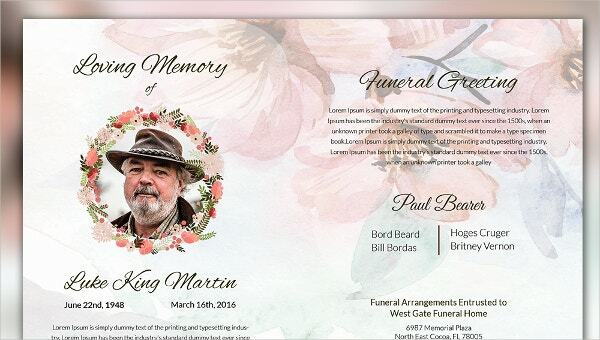 You can also see Funeral Card Templates. The beauty of these funeral greeting cards is that you can use them to exchange information with anyone regardless of age and background, if they had an association with the person who just died. The content of the message fits everyone, regardless of the length of the relationship between the dead and the living.